I have the best homemade frozen yogurt recipe for frozen vanilla yogurt. Now comes the best part - you can customize this recipe to reflect your own favorite flavors by adding fruit, chocolate, nuts or whatever you want. 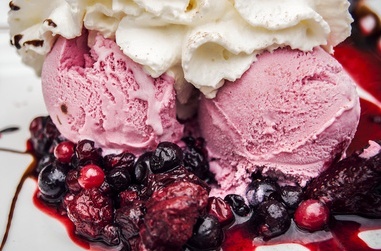 I really love how easy it is to make this frozen yogurt. No ice cream maker necessary and I also give a tip on how to freeze it to soft-serve consistency. Let's get started! Add the vanilla extract and sugar to the yogurt, stir until the sugar has dissolved and place in the refrigerator. It will be ready in an hour to freeze. Follow ice cream machine instructions to process and freeze. If you do not have one, just place the mixture in a freezer-proof container and freeze overnight. If you do not want this to freeze hard, just add 2 tablespoons of vodka to the mixture before placing in the freezer and it will turn out with a soft-serve like consistency. To make a healthier version, you may use non-fat yogurt but it will not be as rich and creamy. Place the cleaned and cut up strawberries in a bowl and cover with the granulated sugar. Mix well, cover and place in the refrigerate for one hour. Mix with the chilled yogurt and vanilla mixture. It is ready to freeze. Place whole blueberries, raspberries, strawberries in a bowl and cover with 2/3 cup sugar. Place in the refrigerator for at least 2 hours to produce juice. Use the mixture to place around the yogurt (as seen in the photo above). Top with homemade whipped cream and drizzle a little chocolate sauce on top. 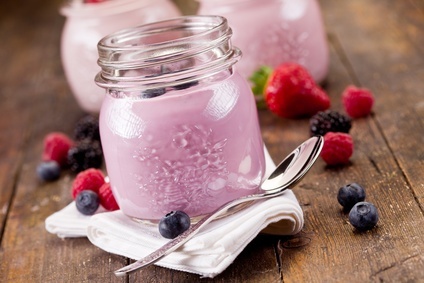 I offer great tips on how to make your own homemade yogurt at the link below. It really is a wonderful and healthy snack to have on hand and you personally know exactly what is in it. What's your favorite frozen yogurt flavor? Peanut butter? Coconut? Please send me a quick note using the form below and it will be posted at the bottom of the page. Thanks for your input!